When things go badly wrong in the world of commerce, we ask about the ethics of free-market capitalism. 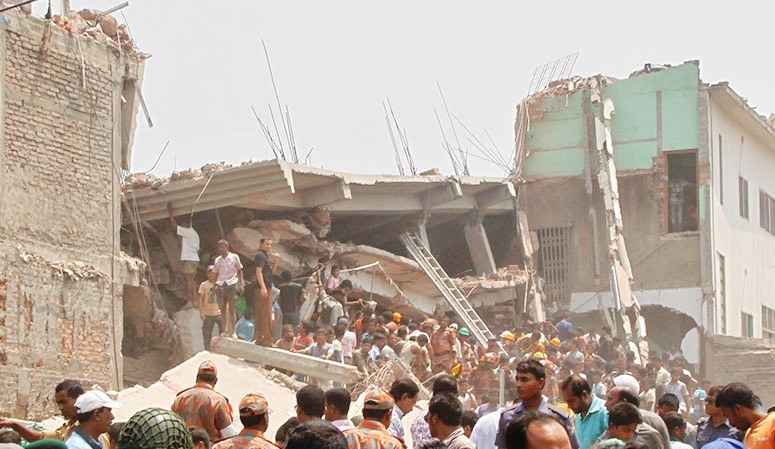 Dangerous cracks had been spotted in the walls of the Rana Plaza building — a factory complex in Bangladesh — but the staff had been ordered to continue working, making clothes for lucrative export to the West. Now over 900 people are dead in the ruins of the building which has collapsed. In the last eight years alone, more than 1,000 workers had died in similar incidents, owing to the negligence of factory owners. The Bangladesh Government has failed to regulate the garment industry by enforcing proper safety standards. Given this tragedy, we might wonder whether unregulated free-market capitalism is a good thing. How can its advocates be correct when they say that the profit motive, property rights, divisions of labour, and competition, actually lead to prosperity for all? Is it really the case that market regulation reduces the entrepreneurial spirit? Those in favour of free-market capitalism maintain that self-interested individuals would mostly engage in win-win transactions: self-interest is natural and beneficial in making untrammelled free markets work well. The pursuing of profits by self-interested companies competing in the market economy is said to cause trickle down benefits even to the poorest: thus an unintended consequence of individual gain is prosperity for all. And competitive markets are said to drive down prices and increase business efficiency. If the biblical message about the love of money being the root of all evil is true, then perhaps maximising profits is undesirable. One can get carried away with free-market competition for the sake of making money. In 19th century America, a lot of people were against outlawing child labour, because to do so would be against the very foundations of a free market economy. One of the obvious recent social trends in Britain has been the huge and still widening gap between the poor and the rich. One can wonder whether even if free-market capitalism reduces the absolute level of poverty in a country, the gross inequality of relative poverty might lead to a divided rather than cohesive society. Writing nearly three centuries ago before the growth of free-market capitalism as we know it today, spiritual philosopher, Emanuel Swedenborg, suggests it is not ethically wrong to make profits. How else can one provide for oneself, and one’s family? Today, like the past, any business that focuses on turnover without profits does not survive. However, Swedenborg says there is an important difference between on the one hand gaining profit through providing a commercial service and on the other hand exploiting customers to maximize profits. For example the ethical cobbler charges customers what he thinks is fair and reasonable for his skill and labour and not necessarily the higher price that the market would bear. He needs to cover his costs and provide for the needs of himself and his family but his focus is on being of help to his community. There is a central spiritual principle here. It is that all spiritual life is the life of wanting what is useful. In other words the inner experience of deep happiness and contentment comes not from material gain but rather from being of service to others and enjoying their fellowship. Working for oneself, one can adopt one’s own rules. However, economies of scale in production mean that large companies operate in large markets which are impersonal and traders operate anonymously. For instance, one might wonder about a manager’s attitude towards sales staff who fail to get the best price by only charging what they feel is a fair price rather than the highest possible price they can get away with. Companies have codes of ethics but we might ask whether the ethical issue of non-exploitation — something that perhaps transcends common commercial practice — could be defined by companies whose investors expect the maximisation of profit. In some parts of the world it is thought that capturing limited resources by greedy exploitation of the weak and uneducated means that many remain hungry and homeless. Here are a few suggestions that come to mind. Curtailing privatisation of natural monopolies (e.g. water supplies) encouraging ownership by the population being served or strengthening the powers of regulators such as in Britain Ofgas, Ofgen etc. Reducing the size and thus locality of savings banks along the lines of the previous mutual building societies before they were allowed to become private banks. Encouraging local markets where business people draw income from activities in which they have some vestige of personal involvement. Admittedly, in the modern global, interconnected world, the ability to do this is limited. Further developing markets in “Fair Trade” products. Creating opportunities for share-ownership of companies. For example the John Lewis Partnership, which owns a chain of department stores and supermarkets, seems to have a good scheme; the company is owned by a trust on behalf of all its employees — known as Partners — who have a say in the running of the business and receive a share of annual profits, which is usually a significant addition to their salary. Whilst the desires reflected in markets remain predominantly materialistic, I believe that an alternative economic pattern will be hard to grow. Therefore, it seems that the best ethical solution is for government not to de-regulate the markets but continue to exercise close control of health and safety, prevention of monopolies and ensuring there is fair competition. The problem is not with free market capitalism per se. The problem arises when greed (the sin) becomes a social norm and society comes to accept it as if it is a virtue rather than a vice. Unfortunately, due to human nature, this happen all too often in the absence of regulation and those who own capital are permitted to exploit those without.